Hi friends! Today I'm sharing an outfit with you that was rolling around in my head for a little while, and I'm so happy it's in physical form now! I purchased this fabric (Heritage Rayon in Treasured Kermes) from the Imagine Gnats shop this summer (sadly, now sold out), and intended to make a skirt or culottes with it. Since, like many of you, I'm sure, my sewing list was miles long, and I just never got around to it. 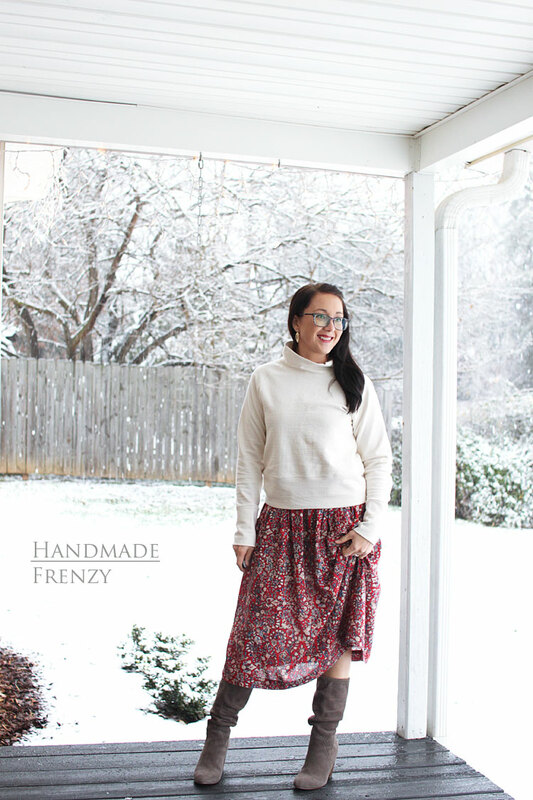 Then fall came, and finally the holiday season and I realized just how perfect this fabric is for all seasons and I NEEDED a skirt made from it! Then came the mental battle of what skirt pattern to use... Or do I draft one myself?? I couldn't decide. I am really happy with how this skirt turned out! The gathers are so lovely in this rayon fabric, and with the elasticated back waist, it is super comfy! And pockets. Pockets are always good. These are a great design element to an otherwise simple pattern. I think this pattern is great to show off an awesome fabric. The pattern comes with 2 views, a knee length skirt with an accent panel at the bottom, and a midi length skirt. The details are easily interchangeable, the pockets can be added or eliminated on each view and it would be easy to add the contrast panel to the midi length as well. 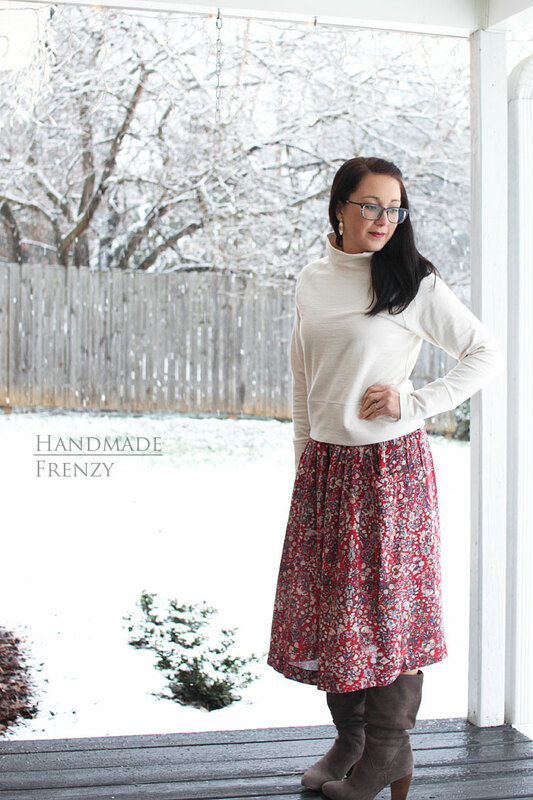 The skirt is meant to be worn at the natural waist, and that is how I fit my elastic, but the bottom of this top covered up the top of the pockets in an unflattering way, so I just pulled the skirt down about an inch below my waist and the problem was solved! I also hemmed the skirt to be about an inch above these boots, but since I ended up pulling it down, it looks a tad longer in these photos. But either way, I'm happy with the length! This is definitely a fantastic beginner pattern and so cute! It's a winner for sure! I love all your makes, especially the Toaster sweater. Your skirt and sweater look really pretty together.